It was a very nice and quiet hostel. 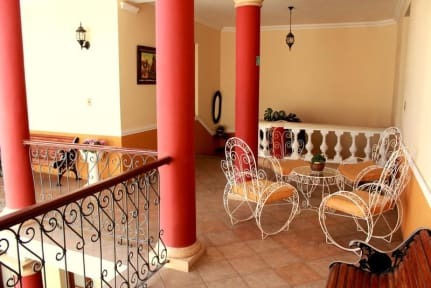 I stayed 2 nights longer because Sucre is such a beautiful city and I loved this hostel!! It’s a big house with a fantastic garden and rooftop terrace. If I come back i would stay at this place again! We really enjoyed our stay there! We were looking for a quiet hostel to relax and that's exactly what we found there! The garden is just beautiful! And the stuff was very nice and helpful! We would definitely recommend it! Das Hostel liegt sehr zentral. Es ist in gutem Zustand, hat einen sehr großen Garten und eine Dachterasse. Es gibt mehrere Küchen und viele saubere Bäder. Man kann Wasser, Bier und Kartenspiele an der Rezeption bekommen. Das Preis-Leistungs-Verhältnis ist sehr gut. + Schöner, ruhiger Garten zum Chillen tagsüber + sehr nettes und hilfsbereites Personal + nicht weit vom Zentrum - am Wochenende wegen angrenzendem Festsaal/-garten mit Party bis spät in die Nacht leider sehr laut. In der Woche hingegen ist es ruhig. Best hostel in Sucre. Cannot recommend it enough. Super Personal, sehr zentral gelegen, schöne Zimmer und Garten. 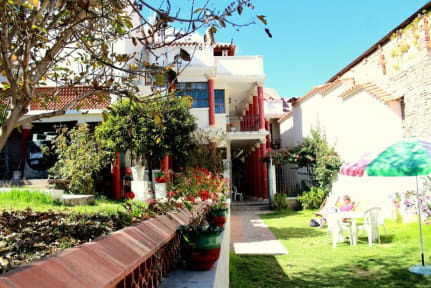 Good & big hostel with comfy beds and nice garden. Only negative points are the cleanness in the bathroom (our toilet didn’t work for 2 days) and the safety. There are lockers but you need to get a key, and they never had one for me. Nevertheless I would recommend this hostel because of his good location and nice atmosphere! The bathroom wasn't cleaned during my stay. They only emtied the trash can. Room itself was okay. They have a beautiful garden to relax in!